Some just pulled this out of a dusty dusty garage. Anyone know the year, model, value? Full dura ace but dent in top tube. There are five or six paint schemes from the late 80'sthat follow that masking but are different colors (Hitachi, Panasonic, etc.). Component group -DA 7403- could be early to mid 90's. Serial will help to pin it down. So, the number and paint scheme (Lotto) put it circa 1988. Based on the Z-code the frame is from 1985, though I believe those paint schemes weren't introduced until the 1986 model year. The Columbus decal remnants, in conjunction with the bridgeless bottom bracket, indicate Columbus SLX. 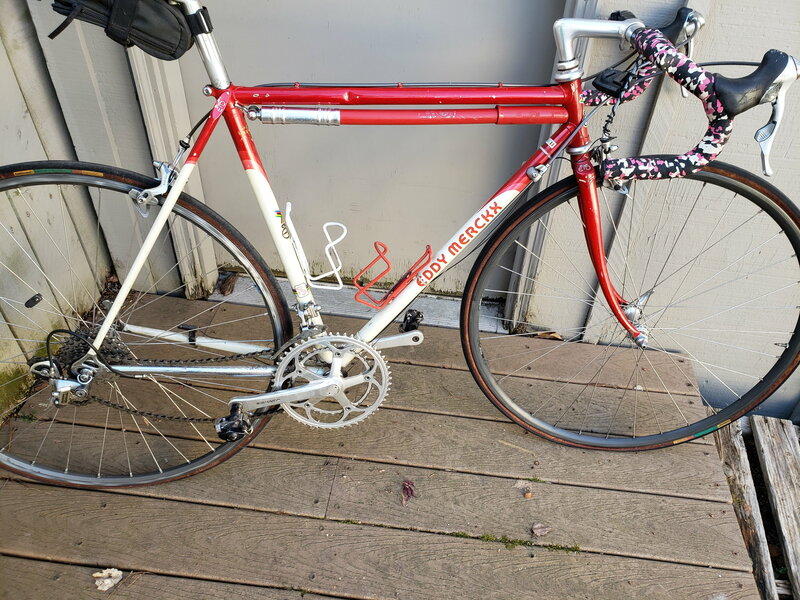 Circa 1986, this model was called the Pro SLX. A few years later, it would become the Corsa Extra but the presence of cable tunnels for external brake cable routing confirms the earlier model. The livery is that of the 1986 Spanish pro team, Kelme. Shimano New Dura-Ace, as seen on the bicycle, came out for the 1985 model year.. 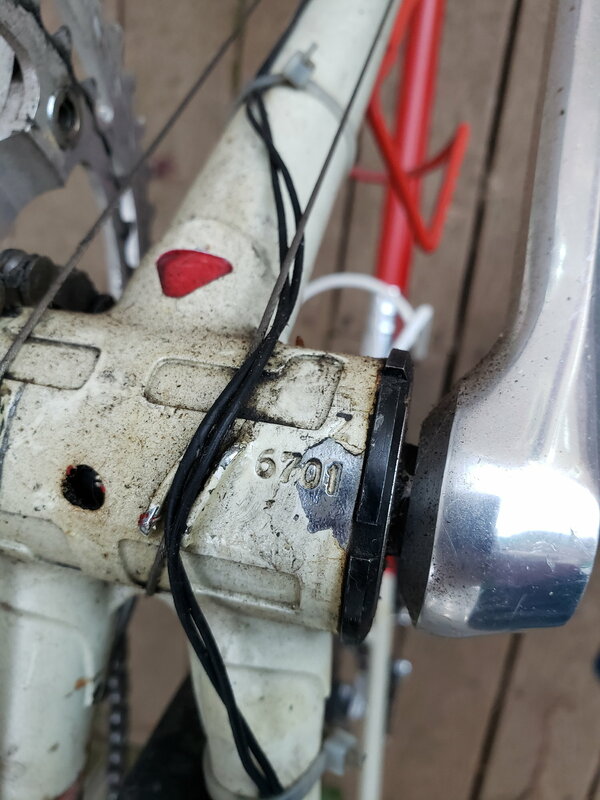 While the STI Levers (brifters) are indicative of early1990s, the single pivot brakeset and rear derailleur with the exposed lower pivot bolt are consistent with the late 1980s version. Consequently, the group may be largely OEM with an STI upgrade. Given the STI, it may also have a freehub/caseette upgrade. Awesome! Opinions on whether this is a a collectible one that should be refurbished, or in this condition more suitable to be set up as a frequent rider. It is close to my size, I think, if I just subbed out the stem, it might be fun to take on some century rides. I thought the Kelme team from that period was green over blue over white. And Lotto was full red until 87 or maybe 88 when they went red over pink over white. 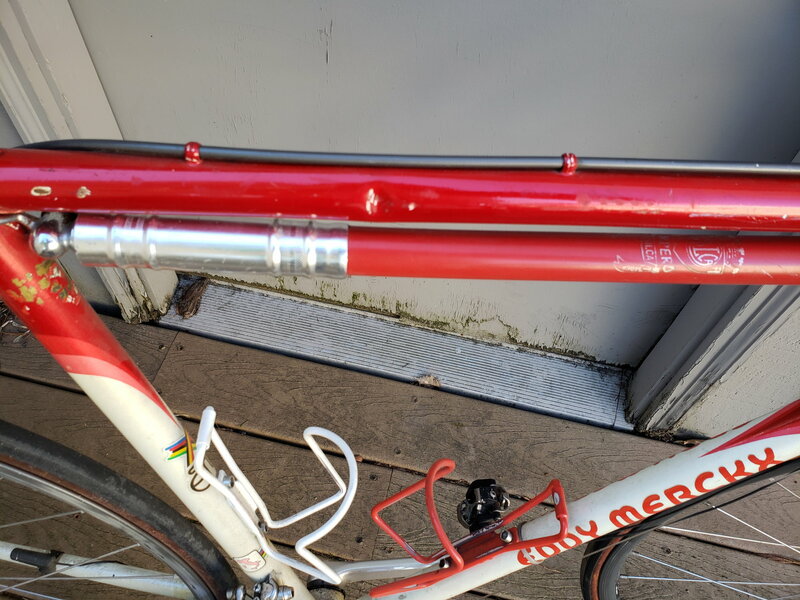 And Merckx 6700+ serial numbers were 1988-ish, the same period that the factory was migrating from top tube cable guides to hidden cable guides. My understanding has always been that the alpha character signifies the year and that the three to four numeral frame numbers were insignificant from a chronological perspective. "Z" is commonly accepted as representing 1985. However, I have yet to find any examples of the new graphics prior to the 1986 model year, so I assume the OP's frame is a 1986 model manufactured in late 1985. You are correct about the Lotto team and their colour transition. Lotto adopted the OP's colour scheme for 1988. Also, given their jersey colours, I can appreciate why you would think that Kelme's Eddy Merckx frames were green-blue-white. However, the Kelme frames didn't incorporate green until 1988 when the frames were two tones of green and white. 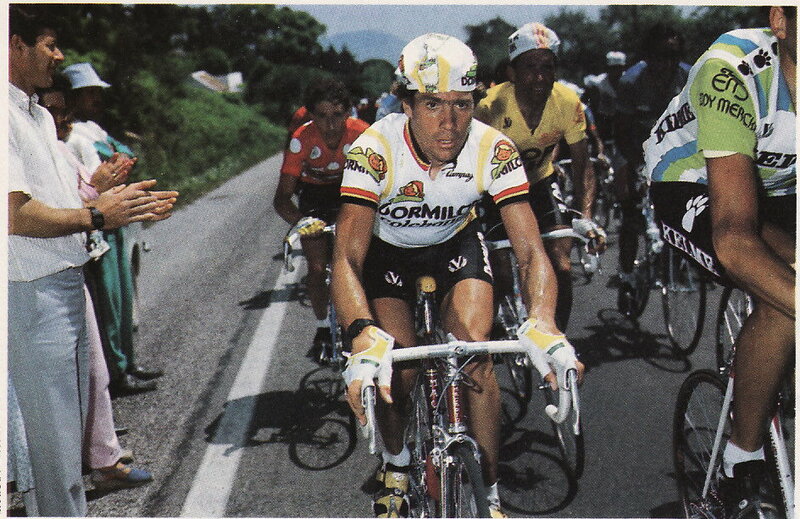 For some unknown reason, the 1986-1987 team issue frames used the OP's livery. Previous to that, their Eddy Merckx frames had been a light blue, white or a combination of the two. It's pretty hard to find confirmed Kelme photos from 1986 but attached is a photo of Van Impe that is known to be from 1986, as that was his only year for Dormilon. To his left, the cropped Kelme rider's frame can just be made out to be on a frame with the OP's livery. 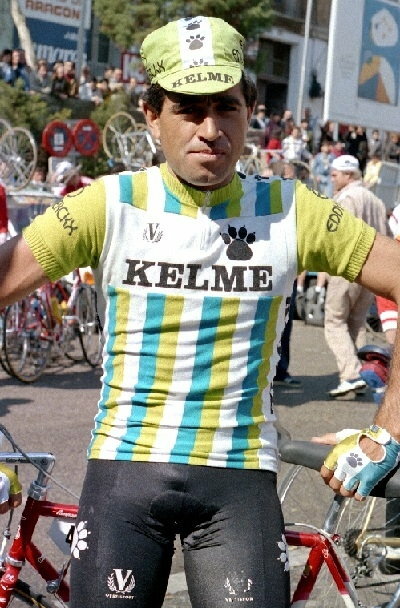 Also attached is a parc fermé photo, showing Kelme rider Bernardo Alfonsel with the same frame and he only rode for Kelme in 1985 & 1986. Last edited by T-Mar; 03-19-19 at 07:21 AM. That dent is a big downer. Probably doesn’t affect the bike structurally but one that size will affect value. Without the dent I’d say that’s worth about $750, maybe $800+ if cleaned up. I’m going to guess the dent drops value of complete bike to $500-600. BTW, I agree with ‘85 dating. Interesting info and thanks to T-Mar for the Kelme background.